Well, firstly I guess I’d better apologise for the lack of a blog last week. I had planned to write one but in the end never quite got around to it! But I do have a slight excuse ….. we’ve been away on holiday to Assynt for the last couple of weeks and I decided that a short break would do me good. I am as I write, sitting in the caravan we’ve rented at Achmelvich just a few miles to the north of Lochinver in the north west of Scotland. This is the final day of the holiday and we’re heading back to Irvine and work tomorrow. Anyway, we’ve had a great time and have done particularly well with the weather. Indeed we’ve had many days of hot sunny weather, especially the first week and even this week has been pretty good too, although it’s gone decidedly cool today. This is the forth time since 2006 that we’ve stayed here and yet this amazing region of Scotland never ceases to impress. In early May there are a few visitors but places are generally quiet and so everywhere is very peaceful. Two weeks up here gives me the chance to relax and re-charge my batteries while at the same time get some serious walking done and gather information for my new paintings. And that just about sums up what we’ve been doing this last 13 days …well with some nice meals and some excellent local beer thrown in for good measure of course! Taking advantage of the particularly fine weather in our first week here, we climbed two of the local hills – Sail Garbh ….one of the summits of Quinag and Braebag, a long high quartz covered whaleback of a hill that lies close to its rather larger neighbours, Conival and Ben More Assynt. We’d climbed Sail Garbh about four years ago but it was great to get back there again …the views being especially fine from its rocky summit. 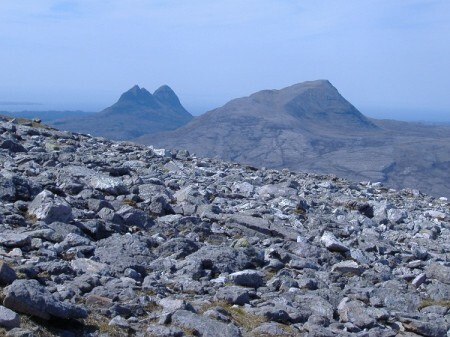 As we weren’t planning to go on and climb either of the other two tops of Quinag we were able to take our time and we spent a good hour at the summit just enjoying the silence. We’d never visited Braebag before and this turned out to be a wonderful walk. 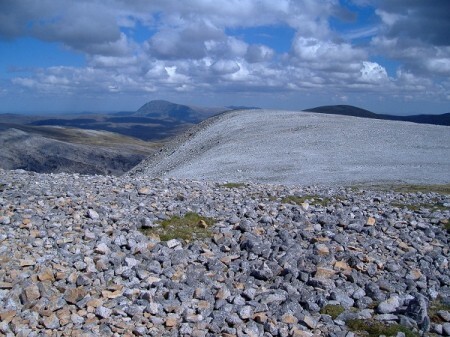 It is, as I said, just a big long broad stony ridge, but when you get up there you find these great piles of quartzite blocks and rubble laid out in long ridges with large areas of moss and grass separating them. It was really quite a strange and beautiful landscape especially with the bright sunshine reflecting off of the quartzite. To be honest, we weren’t really expecting to see anyone on this hill but not long after we’d sat down to eat our sandwiches by a wee cairn marking one of the stony tops, another couple appeared on an adjacent pile of boulders. At this point we started to wonder if ‘our’ top was actually the summit ….their top now looked a wee bit higher. There was nothing for it, after lunch we’d just have to wander over and see …and it was a metre or so higher …and marked with a slightly bigger cairn. During this our second week, we decided to head north and try and climb a couple of these wild hills. We headed for Arkle on Monday and had another wonderful day. 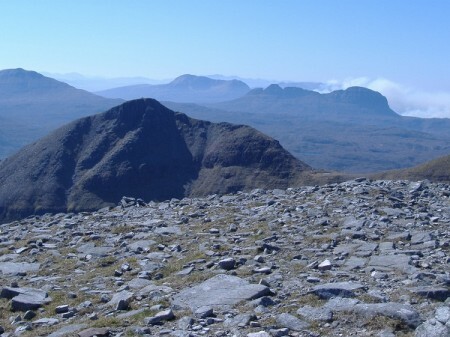 It is quite a striking hill, once again covered in quartzite but with much steeper sides and a wonderful curving ridge leading up to its summit. This, according to the guide book is rather narrow in one section and so a definite ‘no’ for me unfortunately. 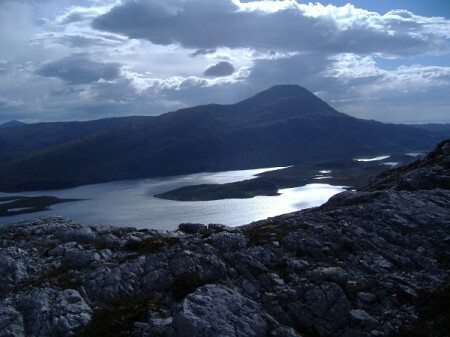 That said we could still climb up to the 750m top at the SE end of the ridge and from there had quite stunning views both of Arkle and it’s higher neighbour Foinaven….oh to have a bit more sight and to be able to wander these wild and dramatic ridges. 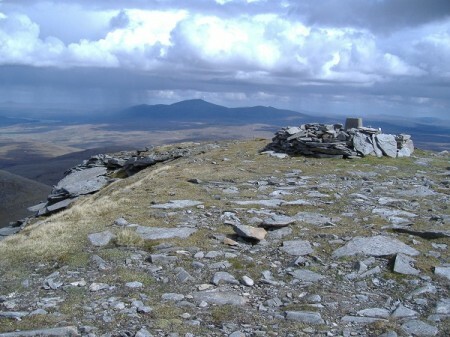 I can’t complain though, to sit there on this lonely wind swept top was very special indeed. Our final hill of the holiday was Ben Hee and we were once again treated to fine weather. 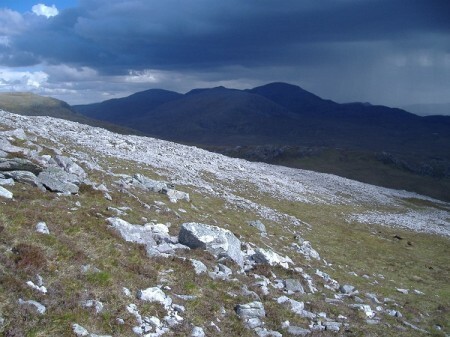 This hill, rising to 873m lies a few miles to the east of Arkle the terrain is much softer. Most of the lower slopes are a mixture of grass, moss and heather and it was hard work getting up to the top of Meallan Liath Mor, a 680m top on route to the main summit. Higher up there were areas of broken rocks and boulders that made for difficult walking but most of these could be avoided. Again we had the hill to ourselves for the whole day and were able to sit at the top taking in the huge views out over Sutherland and Caithness. Ben Hope, the most northerly Munro, stood out well not too far to the north east of us and with my monocular I could make out most of these northern hills. You’ll be glad to hear that I have done some drawing while I’ve been away and have ideas for new paintings and drawings. It’s been good to get away and to visit new bits of Scotland and to get away from the studio for a short while but I’m starting to look forward to getting back to the painting now. So then, I’d better go and start putting things back into bags ready for the drive back to Irvine tomorrow. Hopefully this will be posted by Sunday or Monday and everything will get back to normal!